The two men aged 33 and 47 were just opening up the Thracian tumulus with an excavator when the police arrived after they had been alerted about the crime by local residents, reports Darik Sliven. The mound attacked by the treasure hunters is known as “Golata Mogila”, i.e. the Bare Mound. The two men arrested by the Nova Zagora police have admitted that they were excavating the mound in question in search for archaeological artifacts. The landscape in the valleys and plains in Southern Bulgaria (such as the Valley of Thracian Kings near Kazanlak or the Upper Thracian Plain near Plovdiv, Stara Zagora, or Yambol) is dotted with Ancient Thracian burial mounds. 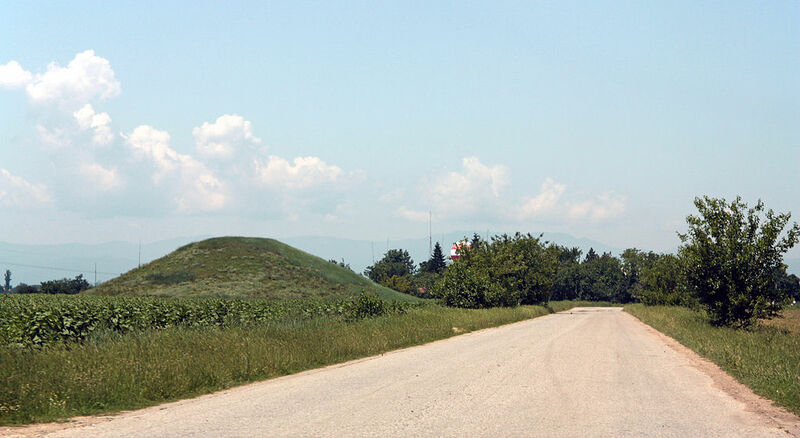 Despite the best efforts of the Bulgarian archaeologists, the vast majority of the Thracian mounds have not been researched yet. At the same time, because of the possibility for discovering real treasures inside them, the tumuli are a favorite target for the thousands of treasure hunters scouting the Bulgarian provinces. In an unrelated development in another treasure hunting case in Bulgaria, a man who received a 3.5-year suspended sentence has filed an appeal at the Appellate Court in the northern city of Veliko Tarnovo, reports Top Novini Ruse. The Ruse District Court has already found Deyan Ivanov guilty of treasure hunting committed on January 19, 2015, together with four other men near the town of Shirokovo, Ruse District. The rest of the men sentenced in this trial have not appealed their suspended sentences. Back in January 2015, the police officers from the nearby town of Dve Mogili arrested the group of five treasure hunters digging at the Late Antiquity fortress Burun Kale. During their interrogation they told the police they had heard the legend about a medieval carriage loaded with gold that was hidden at the area at the time when the Ottoman Turks were invading the Second Bulgarian Empire (1185-1396 AD) in the late 14th century, and were after it. The area around Shirokovo in Northeast Bulgaria has been raided by treasure hunters for over 20 years but their raids have really intensified in the last few years, and especially in the recent months. The entire landscape around the town and the fortress is dotted with pits reaching a depth of 2 meters dug up by the treasure hunters in search of the gold carriage allegedly hidden near the Burun Kale fortress at the time of the Ottoman conquest. The Late Antiquity fortress near Shirokovo, however, has not been excavated by archaeologists yet. One recent estimate suggests its annual turnover amounts to BGN 500 million (app. EUR 260 million), and estimates of the number of those involved range from about 5 000 to 200 000 – 300 000, the vast majority of whom are impoverished low-level diggers. The ruins of the Late Antiquity fortress Burun Kale are located near the town of Shirokovo, Dve Mogili Municipality, Ruse District, in Northeast Bulgaria. The unexplored fortress is still called by its Turkish name, a leftover from Bulgaria’s period of Ottoman Yoke, meaning “Fortress Cape”, because of its location on a rock between the rivers of Cherni Lom and Banski Lom. Burun Kale was built in the Late Antiquity. Local legends have it that in the late 14th century AD, in the last years of the Second Bulgarian Empire (1185-1396 AD), before its conquest by the Ottoman Turks, a huge gold treasure was hidden nearby, in chests loaded on a carriage (henceforth known as the legendary “golden carriage”) to prevent the Turks from taking it. The Burun Kale Fortress is about 400 meters long, and 150 meters wide. The fortress had three lines of fortress walls on its southern side. Two mounds mark the location of the two fortress tower on the outer wall protecting the main gate. Another fortress tower is known to have existed in the northwest section. The middle wall and the inside wall also had robust fortress towers whose location is marked today by mounds. The picturesque scenery of the fortress is complemented by rock niches which appear to have been part of a rock monastery in the Middle Ages.